The Port of Southampton is the UK hub for automotive with nine commercial sea lines undertaking 110 calls to 52 ports in 40 countries every month, making it a huge asset for the UK. There are six mainstream car manufacturers producing vehicles in the UK, along with nine major premium and sports car manufacturers, and many of their vehicles leave our shores via Southampton. To meet the needs of the automotive industry, Associated British Ports (ABP) has invested £50 millions in new vehicle export terminals comprising multi-decks with six parking floors (ground to level 5). Two multi-decks have recently come on line with a vehicle capacity of 3,214 and 4,200 cars respectively. While the large but simple steel frame structures with concrete slab decks have been designed as commercial stock holding units, the cable management infrastructure they require is considerable. 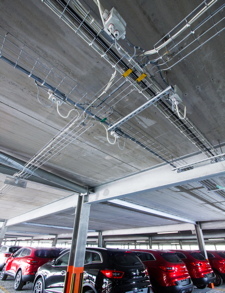 Each multi-deck car park required the installation of more than 10km of cable basket (in this case the Unitrunk EasyConnect ) in an electrical fit out that highlights the flexibility of cable basket across power, data, control and lighting cabling. While many specifiers still underestimate the variety of applications for which cable basket can be used, this installation demonstrates that a correctly-specified and robust cable basket system can have multiple uses. Specifiers can work with their cable management supplier to ensure that they select the right size, weight and finish of cable basket. They should also ensure that data and power cables are separated, although it is often possible to do this using a divider rather than a dedicated run of cable basket. Using a single system in this way can simplify specification, procurement and installation. The car parks have been designed to prioritise space, maximising capacity and enabling use for the widest possible range of vehicles. At ground floor level, each multi-deck features a 5m floor to ceiling height, with 3m ceiling heights for levels 1-4. This involved significant working at height challenges for electrical contractor, Rigfone Electrics, when installing the 10km of cable basket and 1000 IP65-rated, LED light fittings for each structure. Ease of installation had to be combined with a robust and hard-wearing system, capable of meeting the client’s stipulation of a 10-year minimum service life. Unitrunk supported Rigfone Electrics by providing specification support. This ensured that the correct size and loading capacity was used throughout the installation without over-specification. The Rigfone team also received on-site training from Unitrunk to ensure that the rapid installation benefits and ease of use designed into the cable basket was maximised. The contractor reported that this not only helped the installation team to meet project requirements within the designated programme but also enabled the company to save a couple of minutes and a couple of pence on every 3m length of tray, which equate to considerable savings on a project totalling 20km. Just one riser and four runs of cable basket per storey have been installed to cover the needs of the buildings. To protect the installation against the elements, the system was specified in hot dip galvanised steel with stainless steel fixings. 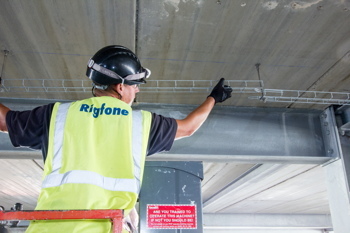 The Rigfone team suspended the cable management system from the concrete slab using metal rods, which were inserted into holes drilled into the slab at 1.5m intervals and fixed in place with resin; a system guaranteed by Unitrunk for a minimum of ten years. With their integral couplers, the lengths of cable basket simply push together to form a secure joint. The system’s design also means that no screws or bolts can be worked loose over time, ensuring that the electrical installation meets its full design life. The cable basket system takes the sub-mains cabling into the building via external risers, which provide the supply to each level. Four rows of basket then run across the ceiling of each deck at 12m intervals to carry small power, fire alarm and fibre optic cabling for the Wi-Fi networks. The fibre optic cabling connects to an RF transmitter at the top of each Multi-deck to provide connectivity between each building. The cable management infrastructure for the DALI lighting control system is also provided by a Unitrunk cable management system. Each building has been divided into three lighting control zones with daylighting harvesting to ensure automated switch off of lights around the perimeter of each building when there is sufficient natural light for these areas. This, combined with PIR presence detection and time out on each staircase, maximises the energy efficiency of the installation. The multi-decks are now fully operational and, looking ahead, the cabling system will allow for ease of access to cabling for maintenance purposes, because all cables are visible through the wire basket. What’s more, the system’s integral couplers will allow maintenance teams to disconnect a small section of cable basket and replace it quickly and easily when they have finished working on that section of cable. Almost 10,000 additional spaces were created, ensuring that the Port of Southampton is the UK hub for automotive shipping by UK manufacturers to reach global marketplaces.